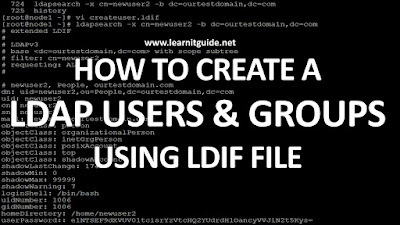 This post shows you how to create a ldap users and groups using LDIF (LDAP Data Interchange Format) file without creating a local user and groups on LDAP Server. 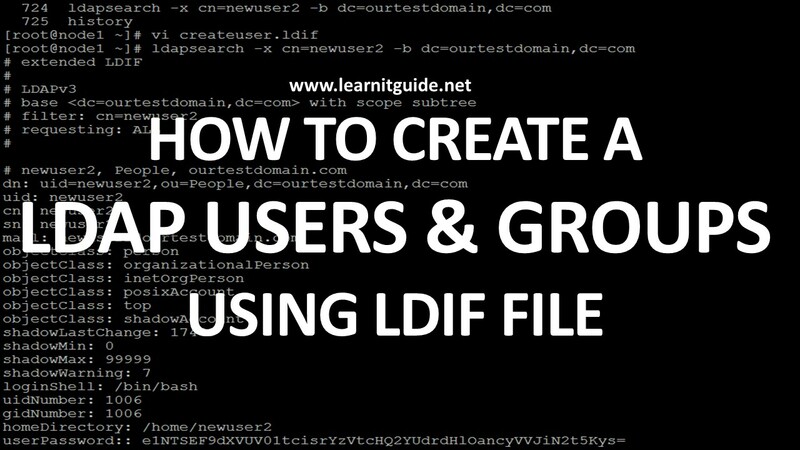 So this post covers only how to create a User and groups with LDIF file not the entire procedure to setting up Openldap Server. Refer this link to know how to configure openldap server on RHEL 7 or CentOS 7. Note : If you need centralized home directory along with LDAP authentication, Refer the below links to create a local user, migrate it to ldap database and export the home directory using autofs or nfs. Hence users home directory also available from ldap server to the clients. Else if you use a LDIF file, authentication will happen from Ldap server and home directory will be created under each server. For this demo, I have a running Openldap Server with following details and we are going to create a user called "newuser1" with UID 1010 and GID 1010. Use the ldapsearch command to print the object class details of an existing Ldap user "ldapuser1". From the above output, copy the highlighted details in red color and proceed to the next steps. Now create a file "usercreate.ldif", paste the copied content and change the required details for your requirement. I have changed the highlighted parameters and save the file. Lets add the user "newuser1" using the "usercreate.ldif" file into LDAP database using ldapadd command. Enter the Ldap Administrator password when it prompts to enter which was created during the openldap configuration. lets set a password to the newly added user "newuser1"
[root@node1 ~]# ldappasswd -s newuser1@123 -W -D "cn=Manager,dc=learnitguide,dc=net" -x "uid=newuser1,ou=People,dc=learnitguide,dc=net"
Again enter the Ldap Administrator password when it prompts to enter which was created during the openldap configuration. Lets Verify the user "newuser1" LDAP entry. Great work, We have got the expected output of a user "newuser1". Lets go to the client end and verify the user is able to access or not by making few changes. Assume that you have already added your client to the Ldap server, if not refer this how to configure linux clients with Openldap Servers. Just update the ldap configuration to create the home directory when user is logging in as below, else you would get an error as home directory not found. Now, Verify the ldap user "newuser1" using the below command. Lets login using the newly created user "newuser1" as below.